Dream Create Inspire: E.A.D. 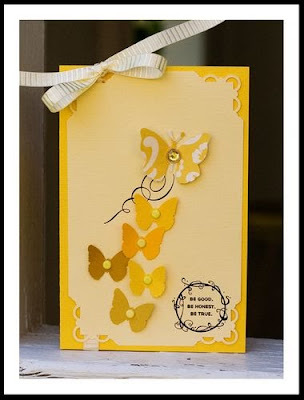 Designs Monday Go-To-Gal Paper Crafts Inspiration Hop! E.A.D. Designs Monday Go-To-Gal Paper Crafts Inspiration Hop! Welcome to the E.A.D. 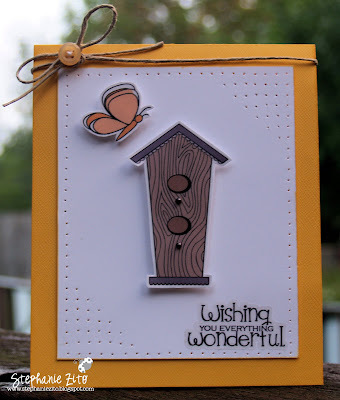 Designs Monday blog hop! You should have arrived here from Amy C's blog, if not, please begin the hop at the E.A.D. Designs Blog so you don't miss out on all the wonderful creations the E.A.D. Design Team have in store for you today! Today is a special hop in that our creations are inspired by Paper Crafts Go-To-Gal Kim Kesti! Products used on my card: E.A.D. Designs Fluttering Blooms Stickerz, Bazzill and Hammermill cs, Colorbox Chalk Ink, Kaiser Pearls, SU paper piercer and hemp twine. Your next stop on the hop is Cassie! :::cute::: I love your take on the inspiration card Stephanie...sooooo tweet!!! Check out all that fabbie paper piercing...such a nice touch! happy monday! SO darling, Steph! I love what you did w/ the paper piecing, too and that sentiment is adorable. Great job!!! Love your inspired card! So pretty! Love the paper piercing and the butterfly is so adorable!! loved the card!! LOVE the needle holes in the corners, that is a very creative touch! How cute are they!?! I can't even pick my favourite - I love the butterflies - nice corner work on that one too; and I love the birdhouse. You are sooooooo creative!